The Department of Geology is very pleased to announce the future acquisition of a new state-of-art instrument: A Raman Microscope. This instrument is partially funded by Kansas State University, the Department of Geology and the College of Art & Sciences. The first priority of this facility is to serve students and faculty in a number of geoscience disciplines and courses, e.g. mineralogy, environmental geology, clay mineralogy, geochemistry, economic geology, igneous petrology, petroleum geology, paleoclimatology and Quaternary processes. It will also benefit, and be accessible to, an array of disciplines across campus, including agronomy, engineering, biology, chemistry and geography. The Raman spectrometer is a versatile instrument that enables analysis of organic and mineral molecules present in gases, liquids or solids. 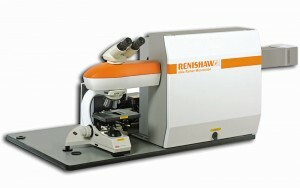 The instrument couples a Raman spectrometer to a standard optical microscope, allowing high magnification visualization of a sample and Raman microanalysis on a laser spot. Technically the Raman method uses the frequency of monochromatic radiation (laser) emitted from the sample surface as the basis for analysis. The change in wavelength provides the chemical and structural information of the analyzed molecular structure. The data it produces can be used to make qualitative and quantitative Raman maps of the sample’s composition and to estimate the type of material polymorph present. Samples do not require any preliminary treatments and analysis times are rapid (< 1 minute).